The third project in the On Site series, in which an artist creates a new work of art specially for this galleria space, features an installation by British artist Liam Gillick. Gillick is best known for his concurrent and ongoing work as a critic, curator, writer, designer and artist. His work often investigates the relationships of power found within the world of politics and decision-making. Using a combination of text, design and installations, Gillick raises questions about the way economic and social reality effect our lives. His interests generally lie in exploring alternate systems of negotiation and proposing open-ended questions so as to allow for the possibility of new and non-ideological answers. While text has always been an important starting point for Gillick's work - he has written three novels, each of which then instigated various sculptural and installation works - it has as of late become a physical part of the work. Övningskörning (Driving Practice Parts 1-30), 2004, is the beginning of an idea that will be explored in greater depth in future exhibitions and subsequent work. In 2000, Gillick was part of a competition to redesign the Town Square of Kalmar, Sweden, the town where in the 1960's, with considerable pride, Volvo instituted its socialistic approach to car manufacturing. While the factory was already closed when Gillick first visited Kalmar, it has become the starting point for his investigation into what might have happened after the experiment was concluded. The text in the installation is the first thirty lines of this story. This preamble consists of thirty lines because the galleria has thirty arches. The story has yet to begin, and like all good experiments, it will be shaped by the conditions in which it is presented. As you walk down the galleria you may notice that some of the details of the story are missing, though the substance of it will seem more concentrated. 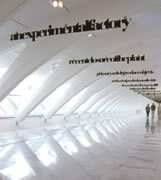 The installation is curated at the Milwaukee Art Museum by Stefano Basilico, adjunct curator of contemporary art. Liam Gillick, Övningskörning (Driving Practice Parts 1-30), 2004.